Ningxia Medical University, founded in 1958 and previously named as Ningxia Medical america.html, is the unique higher learning medical institution of Ningxia Hui Autonomous Region. It is located in Yinchuan, the capital city referred to as “South Beauty beyond the Great Wall” in the northwest. In 1962, it was incorporated into Ningxia University, named as School of Medicine of Ningxia University. In 1972, when Shanghai Railway Medical america.html moved to Yinchuan and combined with School of Medicine of Ningxia University, it was jointly rebuilt as Ningxia Medical america.html. In 2002, Ningxia Health School and Nursing School were incorporated into Ningxia Medical america.html. 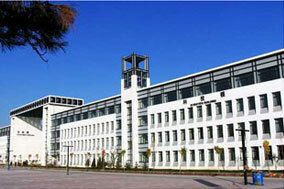 In 2008, it was promoted as a medical comprehensive university with the name Ningxia Medical University. In 2013, the university was approved as Doctorial Degree Conferring Unit (3 first-level disciplines: Clinical Medicine, Basic Medical Science, Public Health & Preventive Health have been approved for doctoral program). With the total assets of about 1.1 billion Yuan, the university covers an area of nearly 833,000 ㎡. It consists of 17 teaching institutions, 10 teaching assistant departments, 4 scientific research institutions, 11 affiliated hospitals, 12 teaching hospitals, and over 90 training hospitals & field practice bases as well. The General Hospital of Ningxia Medical University is a comprehensive first-class tertiary hospital integrating the clinical treatment, education, scientific research, examination and training etc. in Ningxia. It is one of the national 500 largest hospitals, and the medical service of the hospital covers the nearby areas of Inner Mongolia, Shanxi, and Gansu province, etc. The university has one double-hired academician, over 5660 teaching staffs and health care workers, which include 735 full-time teachers, out of whom, there are 422 professors and associate professors; 52.24% have the Master’s Degree and 30.48% have the Doctor’s Degree. At present, there are over 26,000 students in the university, including 9376 full-time students, 1256 postgraduates and 122 international students. The university offers 17 undergraduate majors and 8 first-level disciplines conferring the Master’s Degree. It can confer the Bachelor’s Degree and Master’s Degree for medicine, science and management. The university forms professional discipline system with local characteristics, which focuses on medical disciplines, Traditional Chinese Medicine and Western Medicine coexisting, and multi-discipline coordinated development. built Ningxia human placenta stem cell bank, biological chip Beijing national engineering research center, Ningxia branch center, Ningxia Neuromedicine transformation center, Ningxia medical science academician working station, Ningxia Liupan Mountain medicinal plant resources’ development and utilization academician working station, Ningxia medical postdoctoral scientific research working station, and Ningxia digestive disease institute, etc. In recent five years, the university has more than 1893 varied scientific research projects approved, with more than 120 million Yuan applied for total projects. It has gained great breakthroughs in major science and technology projects, like national “973” plan, science and technology support program, new medicine development, etc. There are 219 National Natural Science Foundation projects approved from 2008 till now, and 10 National Social Science Foundation projects approved within three years from scratch. It has also achieved 78 provincial science and technology progress prizes, published 385 SCI papers, and published 40 academic books. Depending on the advantage of ethnic region, and strengthening the research and development of Hui Medicine, the university established School of Hui Medicine of Ningxia Medical University, Hui Medicine Research Institute, Affiliated Hospital of Hui Medicine & Traditional Chinese Medicine, Ningxia Hui Medicine Modern Engineering & Technological Research Center, and Ningxia Hui Medicine Collaborative Innovation Center, and built the Chinese Cultural Museum of Hui Medicine. The education and research of Hui Medicine has become one of the unique features of the university. Ningxia Medical University has been actively conducting international exchange and cooperation programs. So far it has established academic and friendly collaborative relationships with many scientific research institutions and universities both at home and abroad, such as University of South Florida of America, Sanford Medical School of South Dakota University of America, Shimane University of Japan, Australian National University, Italian University of Ferrara; Peking University, Fudan University, Shandong University, Shanghai Jiaotong University, Capital Medical University, Huazhong University of Science and Technology, and Xiamen University, etc. Being approved by Ministry of Education in 2011, Shandong University has established counterpart assistance relationship with our university. The university has successively obtained many honors, such as national civilized unit, national advanced basic-level Party organization for the performance in the competition activity, national May 1st labor certificate, national May 4th red flag youth league committee, advanced unit for the construction of spiritual civilization in the autonomous region, the outstanding unit of Party's construction and america.html students’ ideological and political work in the autonomous region, the demonstration unit for constructing study Party organization, and the advanced unit of the national unity and progress in the autonomous region. The university is one of the first 50 national typical universities with graduate employment experience, and one of the practical skills training base for humanistic medicine of Chinese medical doctors in Ningxia. Through more than half a century’s endeavor, Ningxia Medical University has become a quite influential and well-known higher learning medical institution with the coordinate developments in its scale, structure, quality and benefit of the nation. At present, the university tightly seizing the opportunity of the construction of western development and Ningxia inland open economic test area & Yinchuan comprehensive bonded zone, strengthens its connotation construction, highlights school-running characteristics, improves comprehensive strength, so as to make great efforts to realize its two first-class construction: first-class medical university in the west, and some fist-class disciplines of the nation, and strive for building itself into modern and high-leveled comprehensive medical university with western characters in China. In September 1958, Ningxia Medical america.html was founded. In October 1962, the former Ningxia Medical america.html, Ningxia Agricultural america.html and Ningxia Normal america.html were incorporated into Ningxia University, and Ningxia Medical america.html was renamed as School of Medicine of Ningxia University. In May 1972, Shanghai Railway Medical america.html moved to Yinchuan, and combined with School of Medicine of Ningxia University to rebuild Ningxia Medical america.html. In March 1980, Ningxia Medical america.html was approved for recruiting 1200 students by the State Council, including postgraduate, undergraduate, advanced students and premed students. Ningxia Medical america.html began to recruit postgraduate for the first time. In November 2002, Ningxia Medical america.html, Ningxia Health School and Ningxia Nursing School were incorporated into new Ningxia Medical america.html. In October 2006, the america.html passed the undergraduate teaching proficiency assessment of Ministry of Education. In September 2007, the new campus was put into use. In September 2008, the america.html was renamed as Ningxia Medical University on the fiftieth anniversary. In April 2010, the university was awarded the honorary title of the first 50 national typical universities with graduate employment experience. In March 2011, Ministry of Education approved that Shandong University and Ningxia Medical University were brought into the project of counterpart support to western institutions of higher learning. Shandong University has established counterpart assistance relationship with our university. In December 2011, the university won the title of National Civilized Unit. In July 2012, the university won the title of national advanced basic-level Party organization for the best performance. The university persists in the school-running ideas of cultivating high-quality & practical medical talents, with noble medical ethics, strict medical manners, consummate medical techniques and extensive knowledge. The university actively carries out the reform of comprehensive experimental courses for pre-clinical basic medical science, and the post-stage clinical teaching mode reform. It was among the first batch of implementing the credit system managing mode among national medical colleges, and has won 2 nation-leveled teaching achievement prizes and 18 province-leveled teaching achievement prizes. 5 nation-leveled characteristic specialties: Clinical Medicine, Traditional Chinese Medicine, Preventive Medicine, Pharmacy and Nursing. Ningxia Medical University offers MBBS program which begins in September each year. The followings are the requirements for international students applying for admission. 2. Abide by laws and regulations of People's Republic of China. 3. Applicants should have a high school graduation certificate or with the similar qualification or above, or with the qualification equivalent to Chinese senior high school graduation or above. 4. Language requirements: Applicants for Clinical Medicine taught in English must have the high English proficiency. Note: Documents submitted and application fee will not be returned to the applicants, whether the applicants is enrolled or not. 2. Once admitted, an admission Letter and a JW202 Form will be mailed to the applicants. With these two documents, passport, Physical Examination Record and other relative documents, the applicants can apply for a student visa from the local Chinese Embassy or the Consulate. 3. Applicants must register at the Foreign Affairs Office on the date specified in the Admission letter with the Admission Letter, JW202 Form, Physical Examination Record, Passport and 8 photos (two-inch, half-length, full-faced, white-background and bare-headed). All prescribed original documents must be handed in for verification by the university. Those who are two weeks overdue are considered abandoning the qualification. Students must live on campus in our university. The international students’ apartment building provides telephone, internet connection, cupboard, washing machine, air conditioner, toilet, water heater, public kitchen, etc. Built in the center of the school campus, the apartment building is within the easy reach to the university canteen, bank, shopping places and the hospital. The university began the postgraduate education in 1978, and was authorized for conferring the Master’s degree to the full-time postgraduates in 1986, and to the working staff for the equivalency in 2000. And then in 2008, the university obtained the qualification for recommending the undergraduates and the teaching staff exempting from the National Entrance Examination for their Master’s degrees and courses. The clinical medicine master’s degree training mode reform of the university was listed as a national education system reform pilot project in 2010. In 2013, the university was approved as Doctorial Degree Conferring Unit (3 first-level disciplines: Clinical Medicine, Basic Medical Science, Public Health & Preventive Health have been approved for doctoral program).